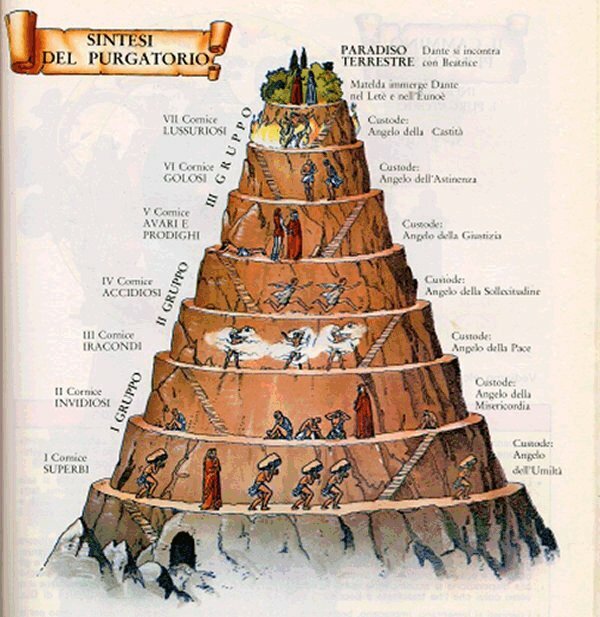 I’m about halfway through Dante’s journey through Purgatory, and the following things have occurred to me. Firstly, just like in Inferno, Dante keeps meeting people he knows. Are they coming out to greet him, or does God put people we know in our paths on purpose? If there’s one thing I hate, it’s constantly bumping into people I know, and exactly why small town and village life annoys me. Cities are great, being able to go to the petrol station at 2 a.m for tea bags and chocolate buttons in my Hobbit slippers. No way can I nip into the village here without at least seeing five people who know my name. If that’s how it’s going to be in the afterlife, every ex-colleague and postman, I’d really rather not. Secondly, Dante has a ‘P’ on his forehead. 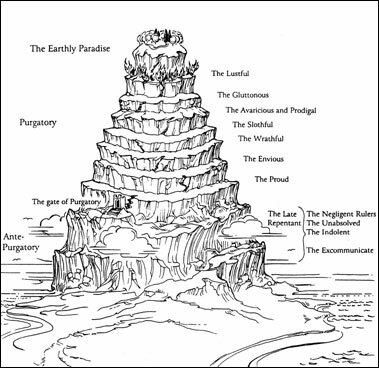 Actually, he has seven, and with each level of the mountain of purgatory he climbs he loses a P. The first level is Pride, so the P makes sense there, but can’t think of any deadly sins that begining with a P, so not sure how that will work. With the removal of each P, the climb is easier (which makes sense, I know I climb better with less P). Thirdly, the book says Purgatory lasts as long as the part of the person’s life during which they were not truly repentant. So, eighty years of being not bad enough for hell but not virtuous enough for instant heaven will incur one hell of a stretch. That is prison to the max. HBO should make a series about it. But then, it seems less like prison, as it has lots of interesting things to look at, people everywhere, lots of leg-aching walking and standing up, and more like a Sunday trip to Ikea. Lust is up the top. I presume that’s something to do with penthouse suites. I could really go for some wedding cake about now. Must stop looking at pictures of purgatory. It definitely does! Purgatory with a snakes and ladders element, either you get up to Paradise, or it’s the snake down the mountain in the Inferno. We should be wedding planners. Haha, love this so much. Thanks for sharing!